Credit goes to @istanforCBE for putting the song together, without DJ, shouts&tags , and making it better quality. "I Need This" was written by Felder, Warren / Allen, Rob / Cornish, Jessica / Brown, Chris. 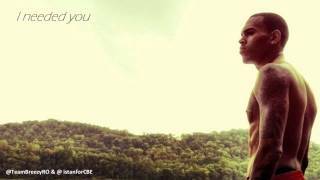 I Needed You Lyrics by Chris Brown. Chris Brown Lyrics ... I needed you When I needed a father figure. I needed you To stop me from makin' a wrong decision.